I have lived near Lake Michigan for all of my adult life, and when I moved here I noticed that the people were different. Was it the water’s tidal pull or did an inordinate amount of strange folks gravitate here? That question re-emerged as I watched Bruised Orange Theater’s fascinating production Lakefront Property. Lakefront Property tells the story of two isolated and lonely souls who live in a fantasy world – literally. Jeff Harris plays the self conscious Pokey who constantly puts himself down as fat and unattractive. He has an imaginary girlfriend named Trisha who is played with brilliant insanity by Ann Sonneville. Trisha is what could be called the postmodern girlfriend experience. She is demanding, impulsive, sexually driven and, did I mention, a figment of Pokey’s imagination? Jeff Harris gives a razor sharp performance of Pokey. He is that guy that you see on the bus painfully shy about everything from his coat to his hairline. He may be talking to himself or is he? Part of Director Mark Spence’s notes relay a line form his favorite band Record Low. ‘What if I’m wrong?’ The theme of this play is just that. What if we the observers are wrong about the pull of the invisible partner or the tides of Lake Michigan? Delving deeper into the parallel lives theory is the character of Kyla, played by Stephanie Polt. Kyla is a coke-addled waitress who is living on the edge of reality. Ms. Polt is achingly real in her portrayal of not wanting to give a damn anymore while her heart longs for the right man. That man turns out to be a ghost named Harold, played with equal parts folksy charm and sinister menace by David Bettino. Harold is from the mid to late 1800’s and comes on to Kyla with the charm of inviting her to an ice cream social. Whatever you believe about ghosts, it is said that there are benevolent and malevolent spirits. Harold comes to take Kyla to the other side. He is attuned to her cocaine habit and dangerous lifestyle and thus sees her as ready to accompany him to a parallel universe where he has literally witnessed train wrecks in the early days of rail travel. She is another wreck that he witnesses. Lakefront Property is written by Clint Scheffer, and this is a revival of a Bruised Orange’s early days. That first production took place in an abandoned storefront without a city sanctioned amusement license! BOTC has come a long way from those days, and have made brilliant use of the Acme Art Works space in Wicker Park/Bucktown. 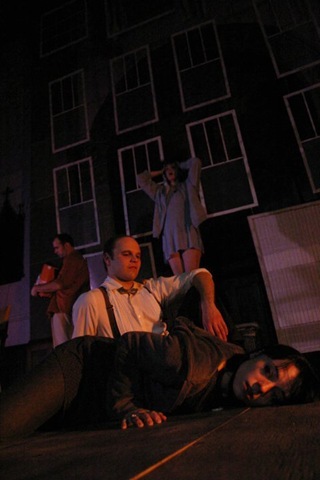 The play is staged in an old protestant church sanctuary that adds a ghostly allure. The stage is set under a mural of Jesus ascending much to the awe and ecstasy of the disciples. Director Mark Spence has the characters flowing in and out of this abandoned altar space as sacrifices to the search for love and companionship from all levels of consciousness. It is a powerful and moving play in these times of personal ads and Internet dating. When Pokey and Kyla find each other after fleeing their imaginary/ghostly lovers I actually breathed a temporary sigh of relief. I say temporary because Trish and Harold remain on the perimeter of the stage glowering just as they remain in the character’s minds. Trish becomes a boiling obsession in Pokey’s mind. He yearns to be wanted by both women – one for real and the other an imaginary backup who will love without fail. Harold becomes malevolent and terrifying to watch. So – what if they are wrong? What if we are all wrong about the search for love and relationship? As Mr. Spence noted, this question turns to a defiant statement after going through the hell of life imagined or hallucinated. Either way you could die trying. This is what I consider Chicago theatre at it’s best. It’s raw, unadorned, and yet skilled and polished. Lakefront Property runs Thursday through Saturday until November 20th and then December 2nd through the 18th on the same days. Show time is 8:00pm. Get there a little early to check out the exhibit in the space as well as to sit in the theatre space itself. Let the ambiance of the old sanctuary get inside your head a bit. You might feel a bit of that parallel universe tugging at you. Acme Art Works is located at 2215 North Avenue in Chicago. Go to www.bruisedorange.org for more information.